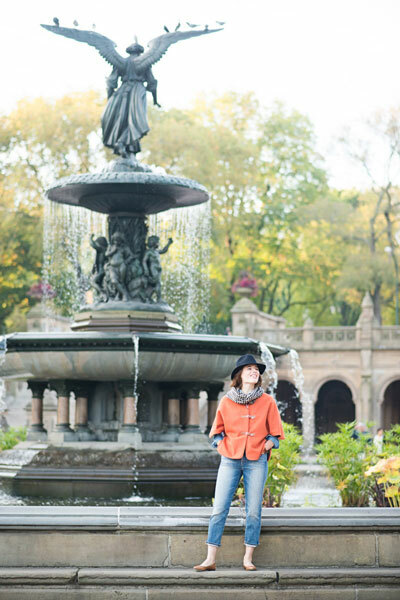 Take a little stroll in this simple, chic, fully-lined cape. With buttons (or snaps) at the sides and the front, it's easy on and off, and comfortable to wear when there's a little chill in the air. 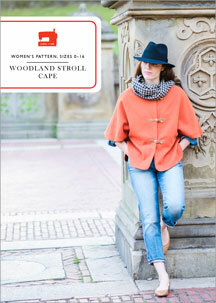 Share your photos on Instagram with the hashtags #woodlandstrollcape and #lieslandco. 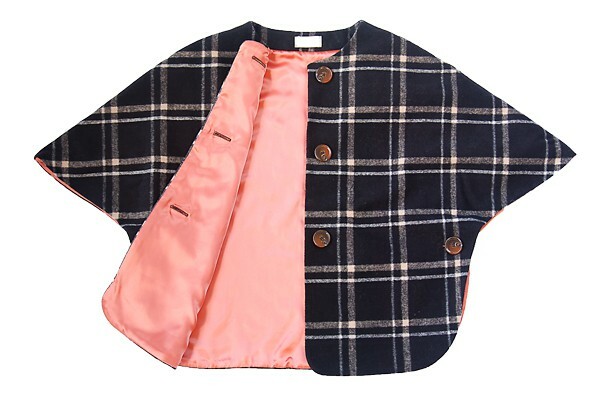 Looking to make a matching cape for a girl 6M-12 years of age? 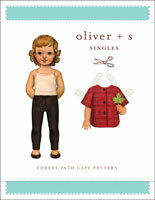 Try the Oliver + S Forest Path Cape pattern. 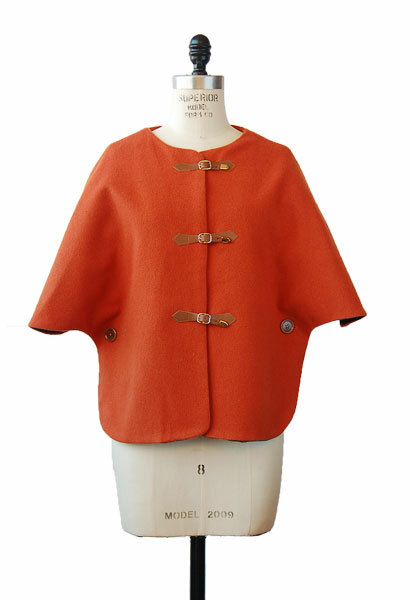 Cape: Wool coating, wool melton, velveteen (cotton velvet), moleskin, or corduroy. 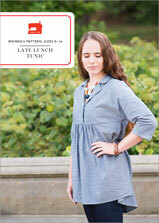 Lightweight fusible interfacing, coordinating thread, five 1" buttons and/or five snaps. Length * 23 1/2" 24" 24 3/4" 25 1/4" 25 3/4"
Hip, Buttoned 39" 41" 43" 45 1/2" 48 1/2"
Sleeve * 17 1/2" 17 3/4" 18 1/4" 18 3/4" 19 1/4"
I have had my eye on this pattern for quite a while, but had never downloaded one before. Finally I just did it and found it quite easy to tape together. I bought lime green ultrasuede and a silk lining, but have not had time to put it together. I think it will be very easy to sew and am not worried that the lining will peek out. Just follow the directions and you will have no problem. I'm looking for the perfect buttons. Perhaps the sea glass buttons on Etsy will look beautiful. Thanks. Great pattern, great instructions, can see another one or two of these in my future! Liked it so much that I inadvertently bought the pattern twice. Now to find the right fabric and look as sharp as the model. Finding a pattern suitable to tromp around a farm is difficult. In spring everyone's thoughts turn to lovely pastel sweaters. On the farm sweaters pick up hitchhiking seeds and leaves, and after a week, they look awful. I made this of a hard wood on one side and rain coating on the other. It's a quick grab at the back door to run out and feed chickens, or grab a couple of carrots for dinner. Directions were great, easy peasey sewing. I was worried that the waist buttons would get caught, so I did a simple hand sew of an arrowhead tack. The cape fits nicely over another shirt & sweater this way. I also hand tacked lining. My only wish? A hood hack! I recently made this cape and love it! I was a little concerned about the lining "grinning out", but after following the directions exactly, it turned out great. I have sewn for many years, but have never seen the trick of a gathering stitch on the curved seam allowances. I also topstitched the finished edge. Looks great. 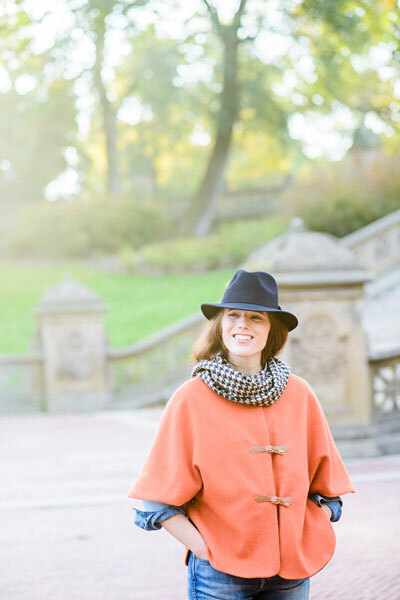 I had made a wool swing coat using a vintage pattern but it overwhelmed me. This pattern was perfect to cut the coat down to a wearable size. I underlined mine with flannel and used flannel backed satin lining for the inside. Just needs topstitching and buttons. Looking forward to slightly warmer temperatures so I can finally wear it after 9 years. 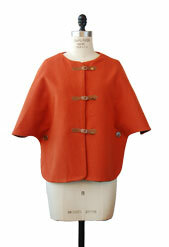 Lovely little cape with shape! I absolutely love the finished garment. It is so perfect for the daughter I made it for. My only complaint is that the yardage requirements listed on the pattern left me with far more fabric than I needed. Since the wool I bought cost $40/yard, I spent significantly more than I needed to. I'm wondering if I can trust other of your patterns to be accurate. The pattern is easy to follow and easy to put together from the digital down load. I choose to make an all around facing as suggested by other reviews. In this I think my inexperience showed a bit because my fabric is a little too thick but after a few hiccups it is all working out well. Just need to decide buttons or snaps and it is ready for London autumn. I love this jacket! Great easy to use pattern. I added some pockets (they're my favourite things!) and it is perfect for the days between summer and winter when there is a nip in the air. Thanks for a wonderful pattern. I made an absolutely beautiful cape with this pattern. My husband stated that it was my very best make so far. It takes very little fabric, so I splurged on a pretty wool and a lovely silk for the lining. I guess "quick" in the other reviews is a relative thing- I am not a very experienced sewer, and I certainly did not finish this in an afternoon. Also, while the pattern is very straightforward, you have to be precise while cutting out and sewing to get the fabric and the lining to lie flat against each other, so that the lining does not peak out and the hem will be straight. I mananged to do that in the end, though. The instructions were excellent, very easy to follow. The only modification I made was to draft a front facing, like Zoe did: http://sozowhatdoyouknow.blogspot.de/2015/12/woodland-stroll-cape.html. And now I am in love with my cape and hope to make another as a present at some point. Also, it is a very practical make: I think it will see lots af wears, as oposed to, say, a formal dress, and it will lend elegance even to an outfit that consists of jeans and a t-shirt. i have had my eye on this one for a while and when chance had it that there was a sale well i couldn't have ordered it quick enough. I made this up really quickly, the instructions were really clear but you could also easily adapt the pattern to your hearts content - adding facing all the way round, making it longer or shorter. I kept it simple and stuck to the original and love the end results. something i can throw on over a casual outfit to make me look more put together or to use even as a smart coat for those occasional moments. this is a great pattern and definitely worth having in your wardrobe. 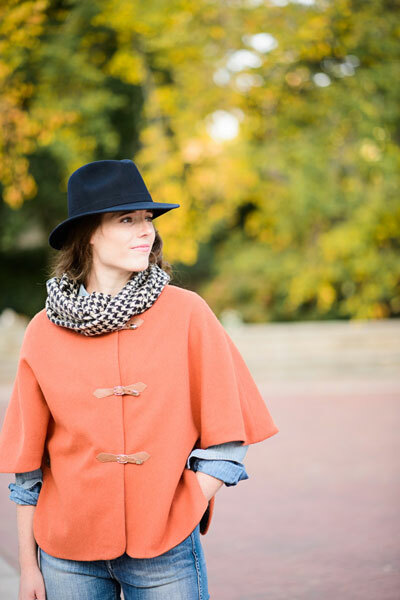 This cape is an easy straight forward project. I used wool melton for the first time and love it. The lining is good quality polyester as it was destined to be a wearable muslin, but turned out better than I hoped. I cut the medium and it fits well and as I'm only 5ft 1" the length hits the right spot on my hips without me feeling as if I'm drowning in fabric. I followed the instructions and didn't skip anything and it was still a quick sew, very satisfying. I shall be making more of these in the future for myself and my daughter. I made this in gold to go over my daughter's wedding dress. October weddings can be cold events here. It was wonderfully easy to put together, it looked great and she felt fabulous! A win all around. I would definitely come back to Oliver and S for another pattern. This was my first attempt at sewing "outerwear" and I am thrilled by my finished cape. I followed all the instructions to the letter and the results were fantastic. I am relatively new to sewing so this project is something a new sewer could easily tackle. I used sew on magnetic bag clasps instead of poppers and added decorative toggle type buttons on the outside as I have never made button holes. The magnetic clasps worked a treat and they fasten securely to keep my check matching across the front straight! Would highly recommend this as a project for beginners. This is a lovely cape with comprehensive instructions. I suggest that ALL aspects of the instructions are followed. I have made two now and think that the sizing is perhaps a bit smaller than expected. I have received compliments every time I have worn mine. I used a wool Melton fabric for both, with cotton lining for one and satin for the other. I love them. I haven't worn it yet but it is super cute! I love this Cape, in the first day of wearing it I was asked by 2 different people where I bought it from. It was really easy to make. I used a wool blend b&w check fabric and Japanese Sunsilky for the lining. I took my time to ensure a really nice finish and it still only took a few hours to make. I did a few practise button holes with the fabric scraps to see if there were going to be issues with the 2 fabrics and it was great. The instructions are great as usual. I can't wait to make another one. excellent instructions so easy to follow and great to be able to print the pattern at home. Very easy to put it together. Love the cape. I think it has a 50's style to it. Would recommend it to anyone! I love this pattern. It is very well-written, and was super easy to follow. Start to finish, I cut and sewed it in a single day. The cape is beautiful and I get lots of complements on it! I made the Medium - usually wear a size 6. I'd made one of the Lisette patterns before, and was really impressed with how well-written the pattern was — and how well the dress fit! So I was eager to try a Liesel + Co pattern. I'll definitely try more of them! 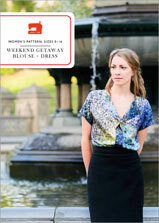 I'd been eyeing this pattern and jumped right in after trying on a RTW item with similar shaping. I used a slippery polyester for the lining which was just a little more difficult than if I'd used a acetate lining. But my lining is so cute that I made an infinity scarf to match my sweet cape. I get lots of compliments when I wear my Woodland Stroll Cape! This pattern is easy to do and quick as well. The instructions are clear although they could be even more with better visuals. Great results I have already made 2 of them. Prompt delivery. Easy to read pattern. I made one so far, but will make many more in the future. I bought this pattern to make Christmas presents for my sisters, I made one in navy wool with brown buttons and one in black / white bouclé with black buttons. They go together in no time at all and the shape is really lovely. Very well drafted pattern with clear instructions, I will be making many more. I bought this to make a present for my sisters Christmas present. It was really quick and easy to make and it looks great to. Very easy to adapt - I wanted a longer version and it was easy to lengthen due to the way the pattern pieces go together. 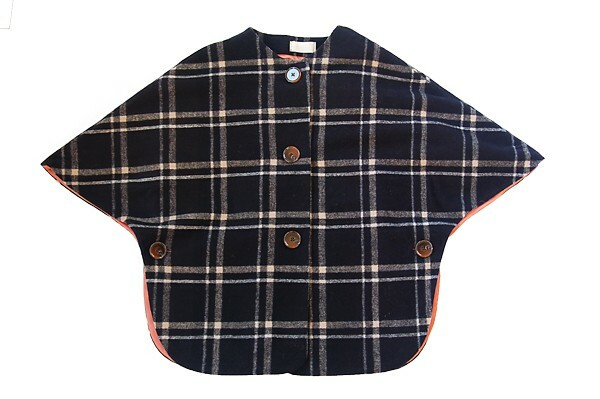 The end result is a very stylish looking garment - made for a friend who is delighted with the style and fit. I've made two capes now, but I still have to put the buttons on them, or choose another closure method. I would love a tutorial on how to make toggles like some of the ones I've seen. I lined one of my capes with rayon, which turned out to be a challenge. The pattern has tons of good tips on how to keep the lining from sagging, but I still had to hand-tack the entire lining in place, even after taking all the recommended measures. I simply used a cotton lawn for the lining on my second cape, and didn't have any trouble at all. I love love love this cape! I made it out of a light weight wool coating and it's perfect for fall. Since I've never used a button hole maker, I opted for snaps covered with large buttons. I found I didn't need snaps under the arms so I just sewed the buttons through front and back layers. The instructions were clearly written and easy to follow. Also, this is the first project that I have lined and the lining fit perfect. No sagging or bunching. Thank you for this great pattern! Love the woodland stroll cape! I adore this cape! I love the design and how it's a more fitted cape with side buttons. The directions were clear and very easy to follow. I used medium weight wool melton and a cotton lawn lining fabric. I opted for regular 1-inch horn buttons and buttonholes. I followed the directions exactly except that I also stitched in the ditch on the top of the arm since I decided not to top stitch around the entire cape. As another reviewer mentioned, don't skip the gathering step. It really helps to lay the outer material flat. I would even suggest tying the ends of the gathers to keep them laying flat (I didn't do this but would for my next cape). 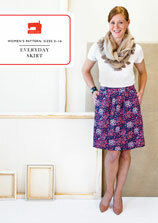 All in all, another great pattern from Liesl! I just finished this cape, and I love it! It was really easy and quick to sew. I followed the directions precisely, and I recommend to all that you take the time to do the gathering stitches that she recommends for the curves before turning. I choose a cranberry polyester satin lining with the cape cut from a coat-weight animal print of gray, black, and brown. I used 3 toggles down the center front and two plain buttons under the arms. There are no directions on sewing the toggles, so I decided to sew them on before attaching the lining. I didn’t want the stitching from the toggles to show on the lining. To do this, I carefully marked the seam allowance so I could put on the cape and know exactly where to place them. I placed the toggles along the same designated area as the buttons, but further out. Since my toggles needed more room, I fused a wider piece of interfacing to the interior of the coat to ensure they would be sewn onto the interfacing. My coat fabric was thick and has a little texture so I marked everything with tailor tacks. The only problem I had was that somehow my lining was cut too small at the neck, probably because my fabric shifted slightly, but I didn’t realize why the two pieces didn’t match until after I was finished. When I went to attach the collar facing, it was the correct size, but the lining was too short in the curve. Again, I didn’t realize it was the lining, I thought it was the collar facing, so I cut the collar facing. Arg-wrong thing to do-note to self-do not do this next time. What I ended up doing to get the cape back to match the lining was to ease in the cape back at the neck to the collar facing. Thankfully, that worked like a charm, and after a few good shots of hot steam from the iron as well as understitching, no one is the wiser and it lays flat! It was off by no more than 3/4 of an inch; I didn’t measure it, and anymore than that I would have probably recut those pieces. I highly recommend this pattern. 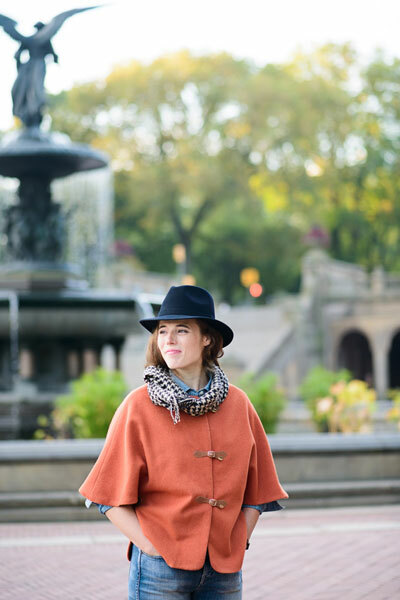 The cape is so very comfortable and chic. I will be making another lighter weight one for spring. Thank you, Liesl! Discussion on the digital woodland stroll cape sewing pattern from the Oliver + S Discussion Forums. Find and share more photos on Instagram using the hashtags #woodlandstrollcape and #lieslandco.